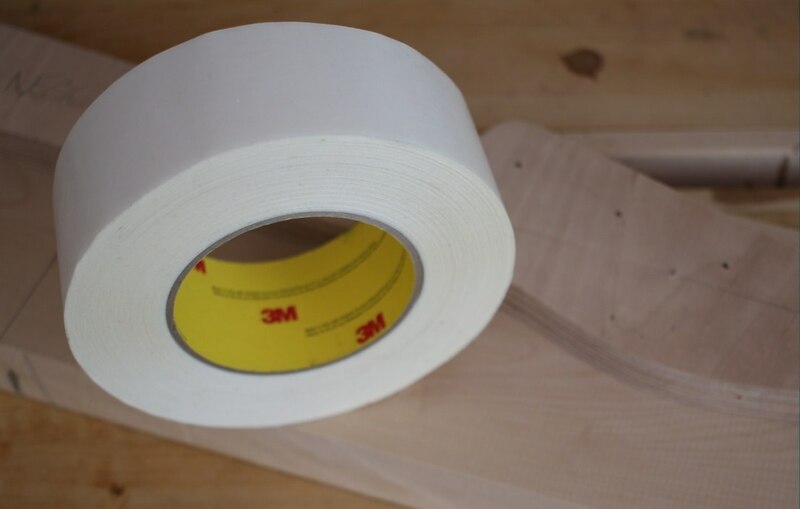 3M 9740 Double Coated Tape - "Where To Stick It"
3M's thin-film double-coated adhesive tapes have been a mainstay product in a luthier's workshop for as long as we can remember....and probably longer. 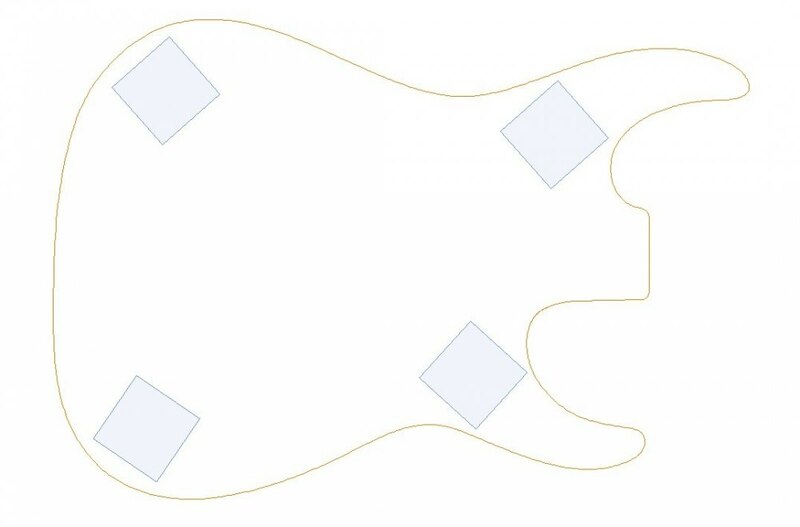 Anything from attaching router template to adhering pickguards onto acoustics, its versatility ensures that a smart luthier will always find new tricks and uses for it. "You know where you can stick it." Well, why do we always assume everyone knows where they can stick it? Suppose you don't know; suppose you're a new guy. You have absolutely no idea where to stick it. I think there ought to be a government booklet entitled "Where to Stick It." I'm sure that the late great George Carlin didn't have double-stick tape in mind in this skit, however we might be able to take a shot at that booklet he proposed if we renamed it, "How You Can Go Stick It". 3M have a long-standing reputation for sticking it producing technically-excellent products that perform in demanding circumstances. Whilst not specifically designed for the luthier in mind (we misappropriate all kinds of things for our devious ends) this pressure-activated tape has cemented itself as a go-to for attaching thing A to thing B with legendary strength, reliability and convenience, whether it be for a few minutes or for several years. A strong double-stick tape is the perfect accompaniment for router templates and accurate temporary workholding such as desktop CNC, inlay pantograph milling, etc. These are without doubt the most common uses this tape sees in the average luthier's workshop and it more than pays for itself off the back of those tasks alone. I've been using this tape for as long as I can remember, and likely bought my first roll from StewMac way back when I was learning to make my first instruments and did a big splurge on their overly-expensive tools like many people in that position do. Since that time, this tape supported me through all kinds of mad uses from car repair to furniture making, stained glass work to electronic repairs, re-applying badges and labels to window decorations. A super-handy solution that lends itself to many problems admirably, and you soon feel lost without it. 3M's technical information datasheet on the tape lists its basic properties which look like opaque numbers at the best of times; simplified, it consists of a polyester film thinner than the average human hair, that the bond strength (when firmly applied to clean surfaces at room temperature) is very strong, yet not so strong that it would be a tricky task to de-mount. Additional properties such as shear strength (resistance to movement perpendicular to the adhesive) is important since that is what guarantees the adhered parts won't slide around against each other. A regular refrain about this tape is that it is expensive, or at least appears to be when you look at it as a single item purchase. StewMac's price ($19 for 2in x 108ft) equates to just over a dollar per square foot. What's so expensive about that? When you look at the fact we rarely use more than a few square inches at a time, you can quickly see that it is pretty damn cheap as a consumable. For myself, factoring in shipping and import duties from StewMac (non-US buyers beware: StewMac use DHL who force you to pay huge fees on top of normal duty and VAT these days) makes my best option Guitars and Woods in Portugal who sell a stormingly large roll measuring 48mm x 55m (1,88in x 180ft) for €23; also just over a dollar per square foot. Excellent. Certainly, if you're located in the EU then you've got no excuse not to pick up a roll or five for your shop! $19 or €23 seems like a significant hit if you're working on a single-instrument budget. In that respect, the argument has validity. That money could go on any number of other things within the project. It is however worth stepping back and considering pulling the trigger now to save yourself being faced with the exact same decision the next time you're on a single-instrument budget. One roll will last the weekend warrior many years and will always be of benefit both in the shop and around the home. Wow. A monster roll of tape! Isn't this like carpet tape or the stuff in the DIY store? Yes and no; almost 95% no. Carpet tapes and similar are thicker and gummy; designed to adhere uneven surfaces and with enough elasticity within the tape to conform to side load without de-mounting. This would be a significant issue in - for example - a router template. Side load from the bearing on a router bit would allow the template to shift in place, making straight edges impossible and resulting in a poorly-finished item. Unlike these thick, gummy, foamy or fibre-bodied tapes, this is a thin film (12 microns!) with a strong engineered adhesive that can adhere even to low-energy substrates (eg. 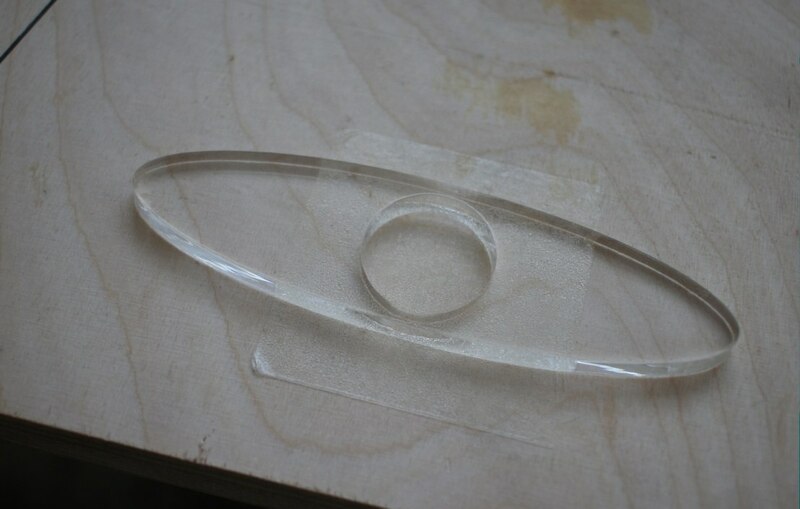 polyethylene) without thick gummy adhesive layers. It does however come in rolls, so maybe there's your spare 5% for comparison. Some say that this is about as close as carpet tape and guitars should ever get. Less Is More....But Isn't More Also More? I guess that I should say something bad about this tape. Perhaps it's strength is a downside; maybe not in terms of a lower-strength version being a better choice though....more in terms of usage. Users unfamiliar with this double-stick tape always have the tendency to cut too much tape at once, covering more surface area of the parts being attached together than is truly required. After all, you don't want to use too little which is fair. Judicious use is far better than overkill for many reasons. Templates or mounted parts that are fragile, have fine edges or soft materials such as MDF can be a nightmare to de-mount if too much tape has been used. The retention strength of excessive tape requires so much wedging and prying that templates easily end up broken, dented, bent, or worse, workpieces get scarred and scratched. Whilst this is in no way an intrinsic fault of the product, it does underline that a definite a learning curve exists. Gauging how much is enough and how much is too much is just something that needs to be absorbed. ....properly applied with sufficient pressure, those four squares will be more than enough to keep the template in check during all but the most abusive routing operations, and can be released fairly easily. Two rows of three or even eight around the perimeter provides additional security. 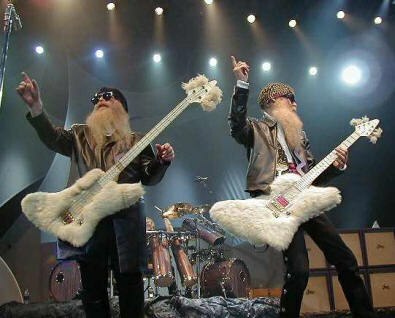 For a neck template, a pad on the headstock, heel end and one or two along the centreline proves adequate. It almost goes without saying that having clean, dust-free surfaces is of paramount importance. You get a feel for it pretty quickly once you go through the experience of de-mounting anything. A 5cm (2in) square piece of tape to hold an acrylic template down seems to make sense, and not too wasteful right? Well, aside from the fact that over half of the surface area isn't covered, a more appropriate use of tape is to cut a half inch and then halve it. De-mounting that big chunk took a credit card sized piece of plastic and a lot of care. I almost regretted using that template as an example! It doesn't seem like that much does it? It's a quarter of the first example. Contrary to what you'd expect, pressing this part down to the plywood with this tiny amount of tape (using a piece of scrap wood and a quick clamp to ensure maximum adhesion) made the template feel like it was glued firmly to the plywood. Unless you really pull and twist on it with both hands, it will be completely solid and in place. A surprising amount of retention strength for such an economical use of tape. Additionally, removing this part is far easier than trying to release a huge square lump. Economy, judicious use and firm clamping pressure wins out every time. Used sparingly and only where it is required, one roll sees you through many builds. Sure, if you're ripping off a couple of feet every time you change grit on a radiusing beam you'll soon work through a hell of a lot of tape needlessly, and pretty much smell burnt money in the air. This tape goes a long long way once you're through the initial honeymoon period. 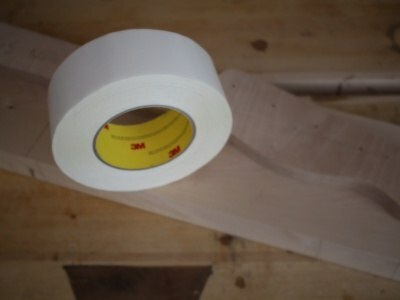 How does this 3M double-stick tape compare to the cheater's method of two pieces of masking tape and superglue? Well, I dislike criticising any technique that (generally) works, however the differentiation is valid and worthwhile making. Double-stick tape is completely predictable, unlike masking tape and glue. The same square of double-stick tape will always have the same performance in the same situation; it's an engineered product designed to perform every time with reliability and consistency. The same cannot be made of masking tape; bonding anything to its top surface is unpredictable, plus different tapes vary in how well they happen to glue up to themselves. Most tapes have waxy-feeling surface compared to others which indicates a more difficult surface for glue to adhere to. 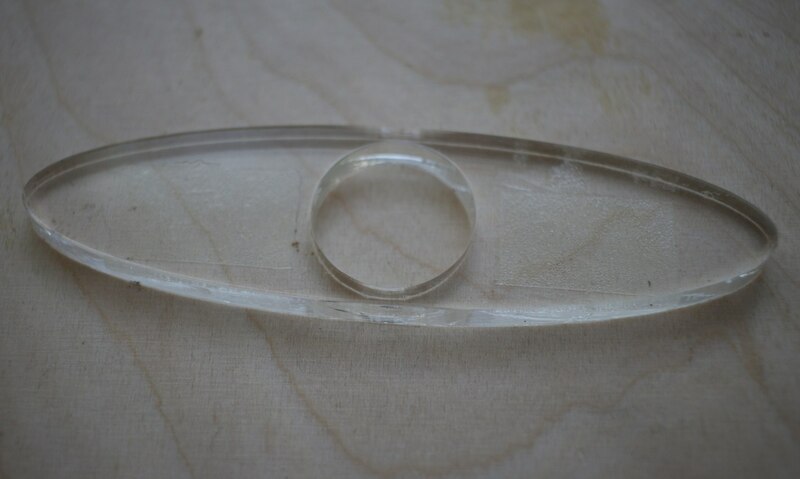 The superglue itself is also unpredictable in how evenly it can bond two pieces of tape; too much and it can squeeze way out and in between the workpieces. To little and you have no strength. Testing it out, masking tape has poor performance when it comes to shear resistance or sideways movement. The low-tack gummy nature of masking tape's adhesive is engineered only to support itself in place and to be removable; not to bear on the stress of loads glued to its surface! This non-critical adhesion enables it to slide around easily when twisted or pulled in one direction; not what you need if you're trying to keep something put. It just isn't capable of giving the level of reliance our work expects of it. Negatives aside, does masking tape and superglue alternative prove to be economical when it does work? Well, given that proper double-stick tape is about a dollar per square foot, the economics are in the region of cents....making the "trick" a ridiculous consideration given the degree of risk that comes with it for no real return. Doing it right comes with an assurance of predictability....and you won't get laughed at by the other kids in the social media peanut gallery when your masking tape fails, ruining your work. Hell, you win more often than not in Russian Roulette, right? Total winner's game. In short? It's a dumb trick guaranteed to cause more headaches than it solves, there is absolutely zero saving to be had and it's a sure-fire way to look like an amateurish cheapskate when it screws up. Don't set yourself up to fail. The old joke about using WD40 when you want something to move and duct tape when you don't is pretty much par for the course with woodworkers, engineers and musicians. Or adults in general I think. This tape is just that for a luthier. Your workshop, ends up with a number of aids that just become an ingrained essential part of your processes. Craft knife blades, Blu-tack, tie wraps, rolls of non-slip mat, bottles of alcohol (mostly denatured), Q-Tips and other things you reach for to solve whatever problem you have in front of you. Reliable performance double-stick tape earns its place alongside those, and the 3M 9740 variant has become the de facto standard by which others are judged. Like Goldilocks checking out the contents of the bears' liquor cabinet, this one's not too strong, not too expensive and does the job every time. 3M 9740 Double Coated Tape - "Where To Stick It" by Carl Maltby is licensed under a Creative Commons Attribution-NonCommercial-ShareAlike 4.0 International License.